Coat a large saucepot with olive oil and add the pancetta. Bring the pot to medium-high heat and cook the pancetta for 4 to 5 minutes. Add the onions, season generously with salt, and stir to coat with the olive oil. Cook the onions for 6 to 7 minutes, stirring frequently; the onions should become very soft and aromatic but have no color. Add the garlic and cook for another 2 to 3 minutes, stirring frequently. Pass the tomatoes through a food mill. Be sure to pass all of the pulp through the holes leaving only the stems and the seeds, and be sure to scrape the pulp off of the bottom of the food mill. That's all of the big money stuff! Add the tomatoes to the pot and rinse out one of the empty tomato cans with water and add that water to the pot (about 2 to 3 cups). Season generously with salt and taste it; tomatoes take a lot of salt. Season in baby steps and taste every step of the way. Cook the sauce for 2 to 3 hours, stirring occasionally and tasting frequently. Cook's Note: A food mill is a kitchen utensil that can be best described as a mechanical sieve. It has a hand-turned paddle that forces food through a strainer plate at the bottom, thereby removing skin, seeds and fiber. You can use your hands to the same effect through a fine strainer. Cook's Note: This recipe can be used in the place of any tomato/spaghetti sauce found in most recipes. 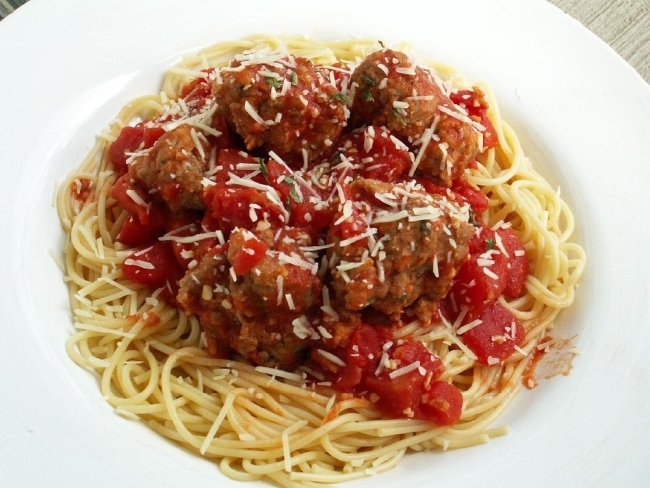 Recipe formatted with the Cook'n Meal Planning Software from DVO Enterprises.